Earl Winfield Van Blaricom was born in Sidney Township, Hastings County, Ontario on 13th May 1890. He was a student at Albert College, Belleville, Ontario, until 1907, when he went on to Queen's University in Kingston, graduating in 1912. He studied law at the University of Saskatchewan, graduating in 1916. Van Blaricom served as a gunner with the Canadian Field Artillery during the First World War (personnel record at http://www.bac-lac.gc.ca/eng/discover/military-heritage/first-world-war/personnel-records/Pages/item.aspx?IdNumber=621022). After the war, Van Blaricom opened a law office in Tisdale, Saskatchewan. He served on the town's Council and as its mayor. He retired in 1957 and moved to Kelowna, British Columbia, where he died in 1980. These materials were donated by Earl Van Blaricom to the Hastings County Historical Society in the summer of 1969. Additional materials were donated by his granddaughter, Sue Steinke, in September 2001. Deaccessioned materials included blank paper; illegible notes; envelopes, clippings, and correspondence without family information; Christmas cards; shopping lists; and notes on books to be consulted. 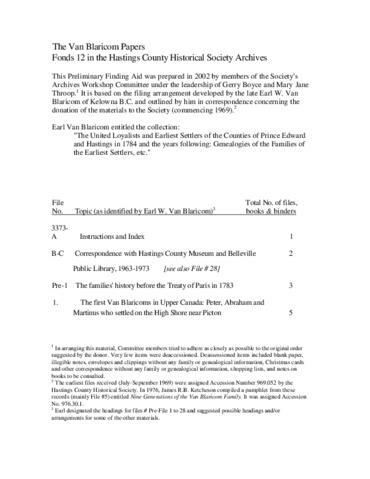 Finding aid prepared by Hastings County Historical Society members in 2002. The arrangement of materials suggested by the donor was generally followed.